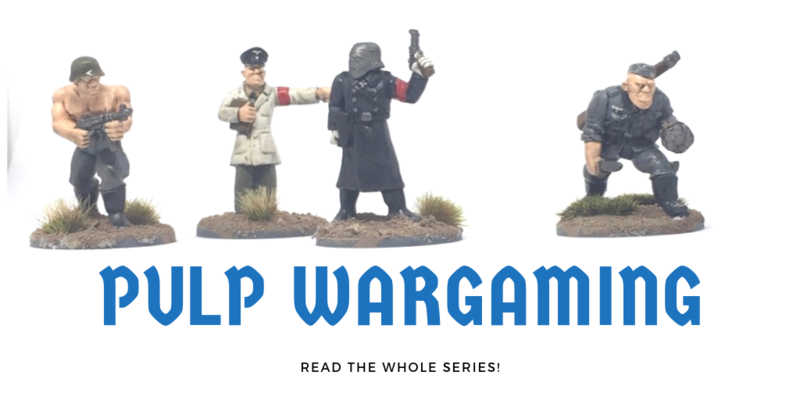 This is the third post of my Pulp Wargaming series. Today I want to cover my Top 10 pulp movies for wargaming. And please note, this list is highly subjective. So let’s dive in. As wargamers, we are constantly searching for new ideas. Not surprisingly, movies are a big inspiration for a lot of us. But watching them is not only fun, sometimes it seems that we can’t get enough. Watching Indy is cool, but let’s be honest, we want to be like him. Well at least on the tabletop we can! So what can we as wargamers get out of movies? Well, obviously any movie has some kind of plot. This can offer some inspirations for our own games. Some ideas just had to be played on the tabletop. And some villains are so over the top, that they are perfect for our needs. But the biggest advantage of movies over books are the visuals. Of course, there are inspirational books too, but in this regard, movies have a big advantage. You can really see the locations, the props and so on. This can be a huge source of inspiration for your hobby. Especially in regards to terrain making. But now let’s take a look at my top 10 pulp movies for wargamers. While some of them are very popular, I hope that there are still some hidden gems for you. The first time I watched this movie I was still a kid. Not the most serious film, but the plot, the setting and the cast screams pulp. And of course, there is a villain. A German fellow and this time, not even a Nazi! Last Man Standing is a great movie. It includes everything you would expect in a pulp movie: mobsters, shootouts, ladies. Packed in a sandy ghost town, it is a hell of a ride. Honestly, just grab the Vice Alley supplement for Pulp Alley and start gaming. It is that easy! If you need inspiration for crime fiction, than The Untouchables is a great movie. The characters are lovely and you won’t be disappointed by the locations. One of my personal highlights is the scene featuring the Mounties! I guess there is no debate, that this is a pulp movie. Personally, I like the visuals and the whole plot. This movie could be easily converted into a great pulp campaign. James Bond may be the most controversial item in this list. I guess as always it depends on the personal definition of pulp. I use this term in a broader sense, including spy-fi. That’s why 007 made it to this list. I picked The Spy Who Loved Me because it is very inspiring regarding pulp wargaming. You can find a mad villain, a secret base under the sea, pyramids, crazy gadgets and of course Jaws! Another great movie. Unfortunately, the movie isn’t that popular and wasn’t a big success. But indeed this is a pulp movie. Great locations and even sky pirates! Besides that, we are seeing a youthful Katherine Zeta-Jones in a leather catsuit. Simply read the quote above. I guess there is nothing more to say. The cast would make a great league for Pulp Alley! There are a lot of King Kong movies out there. Personally, I prefer the 2005 movie featuring Jake Blake. Even over the 2017 movie Kong: Skull Island. The latter is also a good inspiration, but I guess the 2005 movie is even a little bit more pulpish. Hell, some of the characters seem to be directly out of Bob Murchs Pulp Figures range. Honestly, this pick is more of a #1b, because the movie is simply awesome. It contains one if not the best hero ever, Nazis, a great plot and even better locations. There is nothing not to like about that movie! I chose the third movie of the franchise because, in my opinion, it is the best. But you can’t do anything wrong with watching the other flicks too. The Mummy is finally my number 1 pick. Of course, we are talking about the movie with Brendan Fraser and not the Tom Cruise flick. The latter is crap. The Mummy (1999) and the Mummy returns (2001) are one of my all-time favorite movies. The first movie is slightly better in my opinion. But booth are full of great ideas for pulp wargaming. Without any more words: go and watch them! I hope you enjoyed reading my Top 10 pulp movies for wargaming. Obviously, I was limited to ten movies and there are a lot more, which would deserve to be on this list. The Quatermain flicks for example. But I didn’t include them, because they are way too similar to other films on the list and I want to cover a variety of pulp genres. I also decided not to include any movies regarding the Marvel or DC universe. Doing so would easily expand the topic way too much. And honestly, most of the recent flicks made no big impression to me. And last but not least, maybe some of you will miss Tin Tin on this list. To put it bluntly: I just didn’t like the whole franchise. As I said, this list is highly subjective. Did I miss something in this post? What are your favorite movies? Put them in the comments. And as always, happy wargaming!